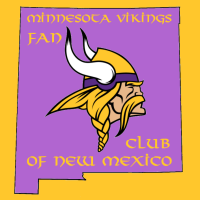 Welcome to the Minnesota Vikings Fan Club of New Mexico! Most of my adult years were spent in Minnesota so of course I became a Minnesota Vikings fan. While in Minnesota I was fortunate to the the team photographer for some of the charitable and cheerleader events as well as doing an ad shoot with Visanthe Shiancoe in his home. I briefly moved to El Paso, TX where there was a very strong Minnesota Vikings fan club and was disappointed when I moved to the Albuquerque, New Mexico area and there wasn’t something equivalent here. After holding events at Slate Street Billiards in Rio Rancho for the past year, it seemed to make more sense to find a centrally located location. The Fox and Hound Sports Tavern seem to meet out needs in terms of dedicated space for us to watch the games as well as a central location close to the interstate. Since we first started going to Fox & Hound, the ownership changed the name to Craft Republic and did a makeover.